Many at the finish line were applauding and trying to shake hands with a winner in life, at the Mumbai Marathon 2010 held recently. 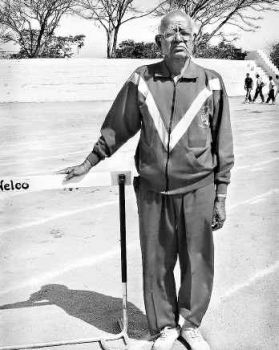 The man at the finish line was none other than the young 85 year Srikrishna Deshpande from Belgaum. Mr. Deshpande retired as a postal department employee in 1981. Then started his athletic career at the age of 65. He has been running for last 25 years now and he has ran in over 225 events in India and abroad. Deshpande said he had taken up running to improve his health and was also encouraging his son to take part in it. For three years, the marathon has served as an annual pilgrimage for the 85-year-old. He bagged a gold medal in an athletic meet in Sri Lanka. Lack of sponsorship forces him to spend money from his pension to participate in national or international events. Mr. Deshpande, who has five children, six grandchildren and two great grandchildren, dreams of securing a gold medal in a world meet in his life time. Another senior citizen and Deshpande friend Rajaram Padwal aged 67 also ran along with him. Mr.Padwal was in the MLIRC. Padwal, who ran the race wearing canvas shoes as compared to many runners who wore advanced running shoes, said he was happy with his timing given the fact that the winner had clocked one hour five minutes in the same event. Deshpande didn’t run barefoot. He had to sport a pair of socks. He had to wear socks as they had to attach chip (to record the time) to his leg. This is really a motivating article for the young guns.